I was a field archaeologist for 27 years, and I got these as field boots about 7 years ago. I wore them to work in extremely rugged terrain, including desert sand, mud, wading streams, swamps, mountains, from Utah, to Louisiana, to Wyoming, and finally to Colorado. They are finally wearing out, so here I am, looking to get a new pair. Great boots! No break-in! Double H can't be beat for quality, comfort, and price! My 6th pair of these. Great boot for the money. I am going to buy a second pair for going out only. This boot for me, is the best fitting boot ,that I have ever had. A little stiff at first but became very comfortable . And looks great. I've finally replaced the Double H Packer Boots that I've been wearing religiously for years now. I use them for work. Looks good, nostalgic appeal, for me, as well as function and safety on the job. Still easy to break in, which is important for me since I have issues related to Reynaud's Disease, or poor circulation in my feet. These lace up boots in EE width do the magic for me. I've noted some improvements to the boot. Thanks, Double H and Shoeline! Great boot. The only one I want to work in. I'm a farrier and have been wearing double h boots for 25 years. 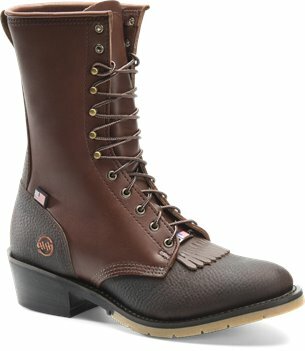 They are the toughest boots I've ever bought and I've tried them all. They are also the most comfortable! This is my first pair of western style boots. They look great. Seems to have good leather & stiching. The fit at first was hard to handle. The hard leather that surrounds the heel is very stiff and unforgiving and has a big interior ridge that rubs thebback of your foot. These boots really hurt my feet at first. You have to experiment with the laces to get it where it'll be comfortable. After about two weeks either the leather softened or the back of my feet toughen up as it did not hurt as much. Keep in mind the heel is cut differently from a work boot so you walk diffently, maybe taller. Not a bad thing but it was surprising. Once I got used to them I like them quite a. It. Great boots at the best price. I recommend the boots and Shoeline.com. A hard working man needs a pair of hard working boots. When one pair finally wears out, my husband orders the identical boot to replace it. Best boot he has ever had. 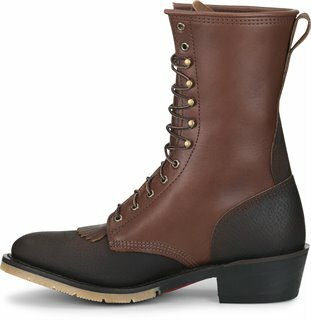 I recently purchased what was probably the last pair of packer style boots by my local double h store. Style no 9622. I read elsewhere that this style is no longer available. Having said that the 9625 style looks like a replacement. So cant really comment on this product but are quite similar. I am really happy with this boot, would recommend. they are good looking can wear with anything, comfortable right out of the box, built well, thanks for reading. Boot cut style heal. Need more shoes like this. I've worn these boots for the last 20 years won't wear anything other then double H's. This was a birthday present for my husband and he was thrilled!! These boots are comfortable right out of the box. They hold up to a lot of use. My husband wears these daily to work and is on his feet for hours on concrete flooring. Ordered for my husband. He really likes these. Light weight and easy on his feet. After wearing these boots many years I tried a different boot. I am glad to get back into the Double H Packers. Excellent boot very comfortable and made in USA. Awesome boots no break in needed light weight comfortable. Another great pair of Double H boots. Great boots. Lighter weight but very durable. The removable footbed is nice to have. Worn 6 days a week with hard use. They are a great value. I like these boots my feet never get tired or hurt. In them I like them for work and riding and every day use.I’’ve wore these boots for over ten years I really like these boots thanks double H keep it up and going made in USA. Absolutely the best pair of boots I have ever owned and I have three pair that I have abused in the everyday work on the farm. My feet are not the best and usually are sore but not in these boots. My cousin is the same way and he loves these boots. Customer service is great too very friendly people. Had to return a pair of boots a slip on pair not these but I had worn these twice already and it was not a problem to return them at all. Highly recommend these boots to everyone. The Double H Packer style C9625 is the best boot I’’ve ever owned. This is the 5th pair owned. The local boot stores don’’t stock this boot anymore but thanks to Shoeline.com I’’m able to continue to wear this boot. HH are hard to find in this area especially the style I like. It is good to be able to order them get them relatively quick. Nice boots and quick delivery had them in about a week. These are good boots for a working rancher i wish they still made insulated packers. I have been wearing these Packer Boots going on 10yrs. I won’’t buy any other work boot. I’’m on mf feet all day great support on a ladder water proof up to 6 inches I can’’t say enough about these boots. The Very Best. This is my first time buying them here. wonderful boot but the first day my husband wore it the heel fell off I took it to the boot repair shop and they fixed it - it’’s fine now. Everything went very smoothly. You had the boot I wanted my size and it was simple to order. Delivered on time. This is the place to buy shoes at an excellent price.